Did you know thermal film markers provides a safer outcome for law enforcement officers? For years, vinyl numbers and letters have identified police vehicles. The problem is, vinyl numbers are difficult to locate for your air support. Also, vinyl is useless for your operations in the dark. Communication from air to ground support becomes a chaotic mess. The good news is infrared technology is changing the way police vehicles are marked. Thermal imaging devices mounted in a helicopter and UAS units are transforming police operations. The bird’s eye view partnered with our new thermal film markers is boosting communication between air and ground units. Learn why your operation should give thermal markers a tryout! Thermal film markers can be seen 24/7. Thermal film markers are effective in bad weather. Thermal Markers can streamline your operation readiness. Regardless of the time of day, the same imaging equipment will enable the operation to run smoothly and effectively. Neither daylight nor darkness hinders your ability to see who is who, or where they are. In contrast, vinyl markers are only visible to the naked eye during the day or with a spotlight at night. A spotlight can be a real problem when you are in a covert operation. Rain, smoke, sandstorm, and fog are challenges for many reasons. But thermal markers are still distinguishable in these conditions. The markers can cut through these conditions and be seen by the thermal imaging device. Vinyl markers are virtually useless in these circumstances. Caution: Water on the film will temporarily disable an ID but will not damage the film. Remove the water and you are good to go. The simple application of thermal film on your vehicle will positively enable a positive ID. There is no competition for the clear difference you will see with a thermal marker on your vehicle. A vinyl marker is seen with the naked eye during the day but is completely undetectable at night. For instance, in the case of car chase, you can distinguish your marked unit from the those in the surrounding area. Your ability to determine who is the suspect and who is the police is a huge advantage in making a capture. While vinyl markers have been very, very good to law enforcement… infrared science is accelerating our policing to a new level of fighting crime. Thermal films partnered with thermal imaging cameras are making it more difficult for the criminals to escape the scene of the crime. Call today and we will help you take the next step towards equipping your vehicles with thermal film. The advancement of thermal technology has put the power of the capture into the hands of the police. The future of fighting crime with infrared science time has come. Tom founded IR.Tools™ in 2006. 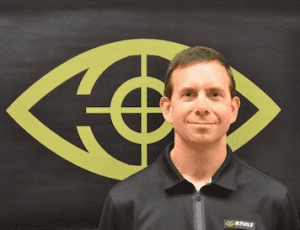 He has embraced manufacturing premium IR patches, panels, thermal markers, and thermal targets to better protect and train the military and law enforcement communities. Always the innovator, he is always thinking out of the box. Currently he has 21 awarded patents, and 14 patents pending. Tom received his BS and MS in Mechanical Engineering from the Univ. of MD, College Park and his MBA from Regents Univ.